Hydras the almost immortal animals. immortal. Few animals can match the humble hydra’s resilience. The small, tentacled freshwater animals can be literally shredded into pieces and regrow into healthy animals. A study published February 7 in Cell Reports suggests that pieces of hydras have structural memory that helps them shape their new body plan according to the pattern inherited by the animal’s “skeleton.” Previously, scientists thought that only chemical signals told a hydra where its heads and/or feet should form. When pieces of hydra begin the regeneration process, the scraps of hydra fold into little balls, and the cytoskeleton has to find a balance between maintaining its old shape and adapting to the new conditions. “If you take a strip or a square fragment and turn it into a sphere, the fibers have to change or stretch a lot to do that,” explains Keren. However, some portions retain their pattern. As the little hydra tissue ball stretches into a tube and grows a tentacle-ringed mouth, the new body parts follow the template set by the cytoskeleton in fragments from the original hydra. The main cytoskeletal structure in adult hydra is an array of aligned fibers that span the entire organism. Tampering with the cytoskeleton is enough to disrupt the formation of new hydras, the researchers found. In many ways, the cytoskeleton is like a system of taut wires that helps the hydra keep its shape and function. 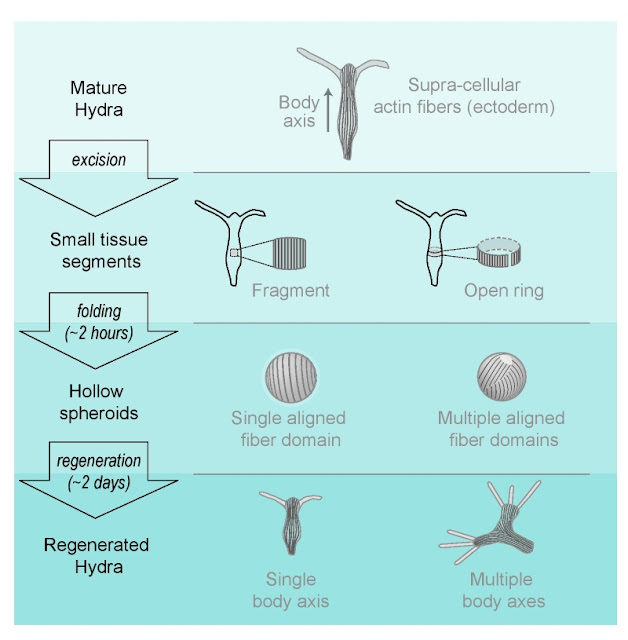 In one experiment, the researchers cut the original hydra into rings which folded into balls that contained multiple domains of aligned fibers. Those ring-shaped pieces grew into two-headed hydras. However, anchoring the hydra rings to stiff wires resulted in healthy one-headed hydras, suggesting that mechanical feedbacks promote order in the developing animal.